Bryce Pettit talks with Mariah Kaminsky at an event that allowed the public to submit ideas for “Common Threads,” an art installation planned for the U.S. 550/160 intersection. This event was held at 11th Street Station. Residents are also welcome to submit ideas for the art installation online at durangocommonthreads.com. Mountains are likely to be featured in a new art installation planned for the U.S. Highway 550/160 intersection, but there’s still much to be determined about the design of the piece. Residents selected large, laser-cut metal panels as the art for the long, narrow medians at the intersection. The 15 to 30 panels will have textile-like patterns cut into them. The proposal, called “Common Threads,” was chosen in an online survey that nearly 2,000 registered respondents participated in earlier this year. The work will be funded by a $25,000 grant from the National Endowment for the Arts. The city plans to match that with $25,000 in cash and in-kind contributions. The city also applied for another $25,000 grant from the NEA that it would also match, bringing the total potential budget to $100,000. Artists Allison Smith and Bryce Pettit have held several events seeking feedback on the new art installation at the U.S. Highway 550/160 intersection. Michaela and Nick Collins, left, Carol Meckling, Nicole Pflueger, Brooke Goulding and Sarah Lawson, right, draw and make stamps at a workshop at the library. The event focused on submitting ideas for the new art installation. Artists Allison Leigh Smith and Bryce Pettit submitted the idea for the metal panels. In May, they started holding community events around the panels’ design, and since then, they have seen strong interest. “We’re getting all kinds of people, with all kinds of ideas,” Smith said. 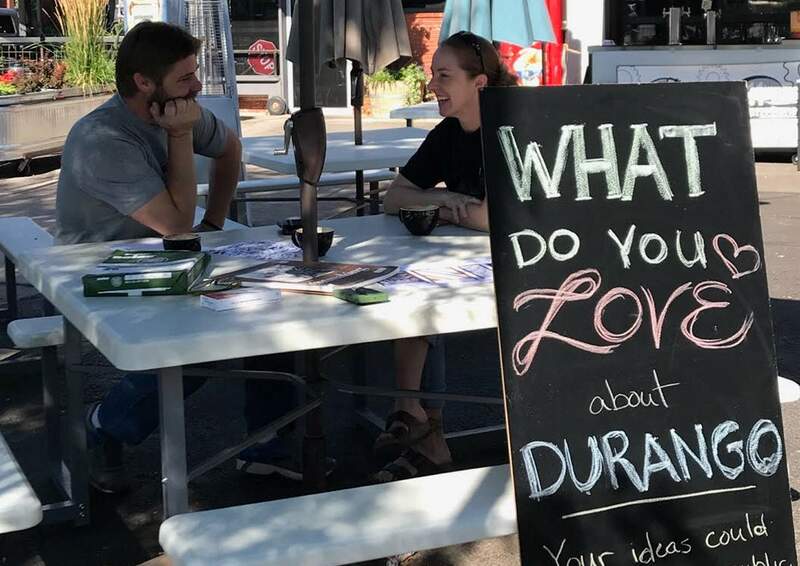 They have held five big events and appeared informally at other events to give residents a chance to submit ideas for symbols that best reflect what people love about Durango. Mountains have been a theme among submissions, and Smith said they will definitely be incorporated into the design, perhaps along the tops of the panels. However, the artists have not settled on a final design for the panels, and they plan to accept symbol ideas through a website dedicated to the project until December. “By sending in something, you are voting for what you want to see,” Smith said. This fall, the artists will hold workshops for students in local schools to give them an opportunity to submit ideas as well. Thus far, the artists have received an enthusiastic response from teachers, she said. The workshop activities will be dictated by the ability of the students, but they may make stamps or charcoal drawings, she said. “Everything is really organic and often dictated by what the participants want to do,” she said. 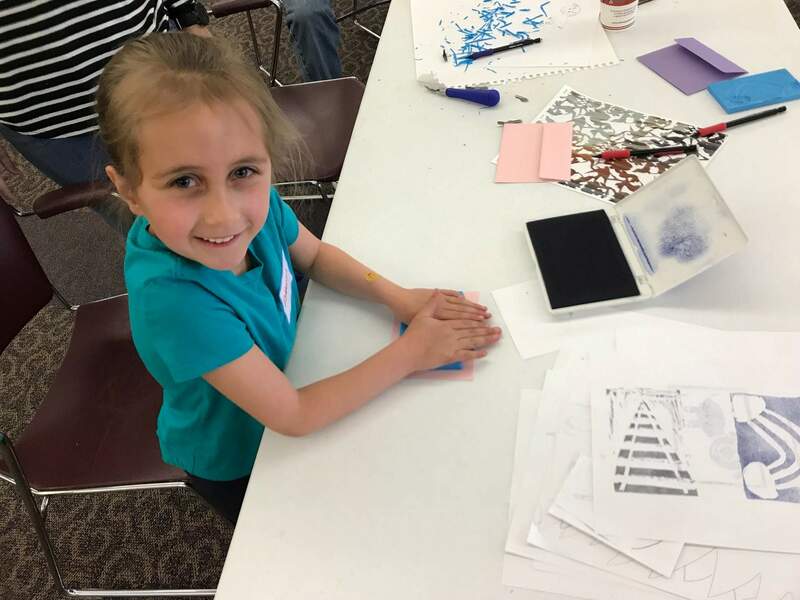 Dakota Killian participates in a stamp workshop at the Durango Community Recreation Center. She suggested symbols of things that make her happy – a rainbow, a sun and a pig. 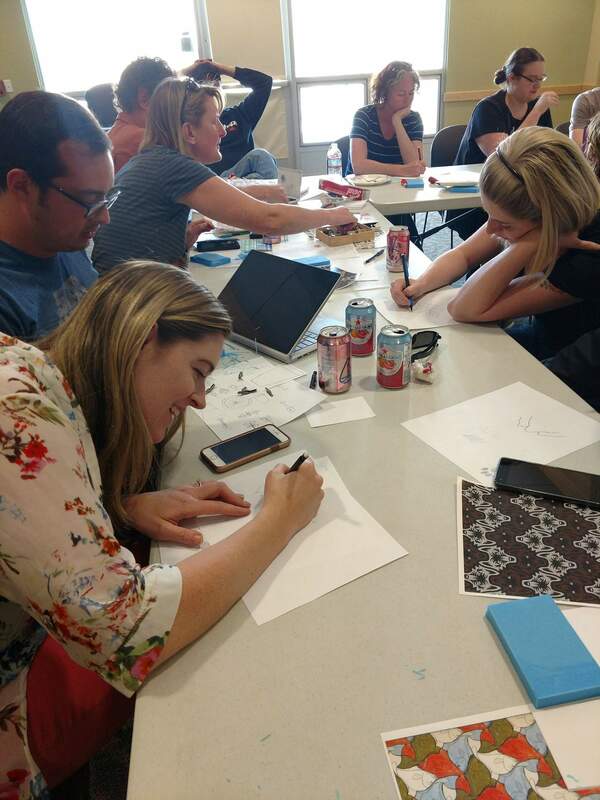 To inspire workshop participants to think symbolically, Smith often asks them to think about what the cover of a book about their life in Durango might look like. When the metal panels are installed at the intersection in fall 2019, Smith said she hopes that many residents will have a personal connection to the art because they submitted ideas. The next public event will be held from 8 a.m. to noon Sept. 22 at the Durango Farmers Market, 259 W. Ninth St. Residents may also submit drawings, photos and stories to the artists at durangocommonthreads.com.